Details and specifications of Davka's DavkaWriter Platinum 4, £69-£129 (GBP inc VAT RRP £139). DavkaWriter Platinum 4 is a sophisticated Hebrew/English word processor with over 50 new features for Hebrew fully pointed with Nikud right-left Hebrew and English wordprocessing and Hebrew unicode export. Microsoft Windows 95 / 98 / Me / 2000 compatible. Check for latest version and upgrades for use on Windows XP, Vista and 7. Buy latest version or call us on 0844 808 3699. See other davka software, Hebrew software and Jewish software. The most advanced Hebrew/English word processor on the planet is now available in a spectacular, ALL-NEW version that's even more user-friendly and powerful! DavkaWriter Platinum provides helpful, sophisticated, easy-to-use tools incorporating the latest advances in word-processing technology. No other program can match its combination of ease-of-use and flexibility! Text Boxes-Compose text and move it anywhere on the page! Flowed Text-Link text boxes to create multiple set of text, flowing from page to page! Yiddish support-full entry of all Yiddish-specific Hebrew characters, including YIVO! Borders around graphics and watermarks-Adds that special touch! Find in Files command-Search for any word or words-in Hebrew or English, in your entire DavkaWriter file directory, and see the results in a flash! New styles in format menu- Inscribed Outline, Circumscribed Outline, Black-Filled Outline, 3D Shadow, 3D Block! Document Tabs--A tab appears along the bottom of the screen for each open document, letting you switch among them with the click of a button. DavkaWriter is very easy to learn and use. It's simple to switch between Hebrew and English, and the on-screen keyboard makes it easy to enter text.Yet, underneath the ease and simplicity lies a powerful and sophisticated word processor. 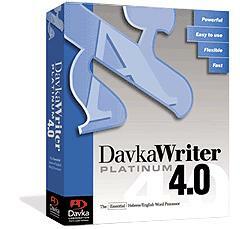 DavkaWriter Platinum comes with a full suite of useful add-ons that make it a truly complete product. There are other Hebrew word processors available. But no other product is as easy to use, and as powerful as DavkaWriter Platinum!